Built 1788, closed 1848, reopened 1963, restored and extended 2003. The Georgian Theatre Royal, Britain's oldest working theatre in its original form, is both a thriving community playhouse and a living theatre museum. 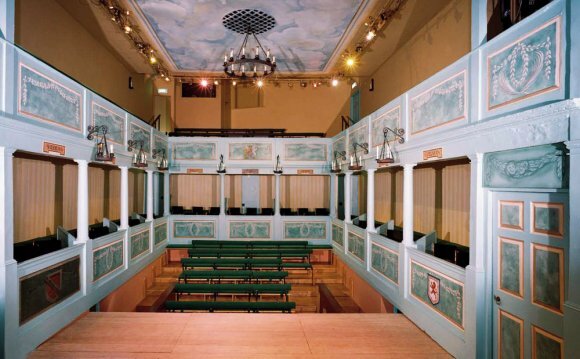 The Theatre welcomes visitors of all ages to its hourly guided tours and museum. The museum is a fully accredited museum (MLA) and a Quality Assured Visitor Attraction. Built by actor-manager Samuel Butler in 1788, the Georgian Theatre Royal was managed by Butler along with his circuit of theatres at Beverley, Harrogate, Kendal, Northallerton, Ripon, Ulverston and Whitby. The Georgian Theatre Royal is Britain's most complete Georgian playhouse. Opening in 1788, the theatre was in regular use until 1830 when performances became less frequent. In 1848 it was let as an auction room. Wine vaults were constructed in the pit at about the same time. In 1960 a non-profit trust was incorporated, a public appeal launched and a restoration began. The theatre reopened in 1963. It is Grade I Listed 'as a building of special architectural or historical interest'. Behind the stage, a small theatre museum was expanded in 1996. From 2002 a second extensive restoration was undertaken and the theatre reopened in September 2003 after this £1.6 m upgrade. The Georgian plays an important role as a focus for economic regeneration and renewal in its rural communities. The Theatre Royal is a typical eighteenth-century country playhouse, and keeps alive an important period of English theatre architecture. No other playhouse can offer such authenticity, and a few other theatres can offer such intimacy. A capacity today of 214 places is arranged in rectangular form: sunken pit, boxes on three sides and a small gallery above. The furthest seat is only 10.7m from the stage, whose proscenium width is 4.72m with a depth of 6.4m to the back wall. Performers and theatregoers are in the closest proximity in this enchanting 'courtyard' theatre, the proportions of which have been emulated many times worldwide in the late twentieth century. The 2003 refurbishments include a new, more authentic decorative colour scheme based on extensive research, reinstatement of stage machinery and simulated candle lustres combined with new stage technologies. A new extension comprises a box office, a third dressing room, bars and foyers, all with greatly improved ventilation and access. Richmond is fortunate in possessing Britain's oldest set of scenery, known as 'The Woodland Scene' which was probably painted between 1818 and 1836. With generous financial assistance from The Sir James Knott Trust and Lord and Lady Crathorne, the scene has been placed in the Exhibition space to the rear of the stage. At the same time a facsimile was made for use on stage. This museum was opened in 1979 by Richard Baker and was the very first theatre museum in the Country. It underwent extensive refurbishment in 1996 with the help of the National Lottery. The Museum is devoted to the first phase of the Theatre’s life and covers the construction, management and operation during the last years of the C18th and first half of the C19th. There is a unique collection of original playbills and hand bills from 1792 to the 1840s which clearly illustrate the changing pattern of entertainment. A “Thunderbox” – ever popular with visiting school parties! – hangs from the ceiling with a simple rope to make it work and background sound effects recreate the rowdy and irreverent mirth of a Georgian night out. In the museum are also fine engravings of artists associated with Butler’s company. There is a scaled down replica of the theatre stage, complete with proscenium door and Juliet boxes, behind which you can see the original woodland scene dating from the early C19th. There is also an interactive costume display. Photographs and autographs of Royal visitors and of the many international stars who have generously donated their time and talent to benefit performances - a tradition established by Edmund Kean - can be seen throughout the Theatre.